Tracy’s story begins as tension grew within the aging Conclave that once ruled mortals’ lives in Cimmeria. The Humans that ruled the Conclave had become increasingly combative and adversarial after the Orcs and Dwarves left the organization. Wars had sprung up with the Orcs and Dwarves as a result. While the Elven members of the Conclave accepted this turn of events, the peace-loving halflings did not have the same reaction. Feeling that the Conclave was no longer the place for them, may Halflings began to leave. Some founded small villages while others formed the roaming caravans of Halflings that still exist in Cimmeria today; however, the majority of the smallfolk stayed behind in the Conclave cities. The decision to stay behind would prove a mistake. The trickle of Halfling emigrants ignited the Humans’ xenophobic rage once more. Harsh words were said, people were attacked, and before long a full-fledged pogrom against Halflings was underway in the Conclave. When the dust had settled, the Halfling leaders decided to take their people out of the Conclave cities. Two new settlements would be founded, larger than those constructed previously accross the surface of Cimmeria. The first, Nomingburg, would house the Halflings of Eastern Cimmeria. The second city, Crafterton, would be a home for the Halflings of Western Cimmeria. The Halflings streamed out of the city and within a week all but a few were gone. Enraged at this perceived betrayal of the Conclave, the Humans of the Conclave prepared for war. They grabbed arms and armor and marched upon Nomingburg. The people of Nomingburg armed themselves in turn and called for aid from Crafterton and the other Halfling settlements throughout Cimmeria. It is at this point that Tracy enters the story. Tracy had made a name for herself as a cat burglar in Phoenix. Her parents died when she was still young and she turned to theft to support herself. Her skills grew and soon she became a well-known contact for merchants within Phoenix who needed certain items “acquired.” She stayed in Phoenix during the first set of emigrations. During the pogrom Tracy protected dozens of Halfling citizens. She showed them places to hide, got their most prized personal possessions out of burning buildings and away from the hands of Human theives, and slew many murderous Humans with her double edged daggers. When the smoke cleared Tracy left the Conclave along with the other Halflings. She resettled in Nomingburg. As the Human army approached Nomingburg, the Halfling soldiers prepared for guerrilla warfare. They would strike from hidden tunnels in the hills around Nomingburg, harassing the Conclave’s columns before retreating whence they came. Tracy recognized the necessity of warfare to preserve the Halfling way of life, but was there no other way to avoid this conflict? She gathered together a bunch of like-minded individuals and shared her plan. As the Conclave forces approached Nomingburg the Halflings harassed the army as planned. Only when the army stood outside the city walls and the Halflings were forced to draw up in battlelines did Tracy’s plan go into action. On the eve of battle she and her fellow conspirators set to work. In the morning their task was done. Tracy guided the developing cultures of Nomingburg and Crafterton. She set Crafterton on a pathway of technomaturgical advancement. 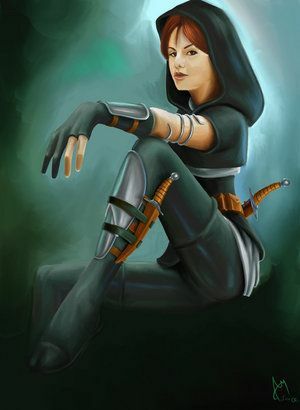 In Nomingburg she orgnanized several guilds that taught people different survival techniques. The guilds would eventually grow to become the assassins guilds of Nomingburg. While the guilds were originally billed as pacfist martial arts organizations, in reality they trained their members to kill in the name of self-defense. The face of high-minded idealism that Tracy showed at the Weaponless Battle was just that, a face. Tracy had killed people before and she would do it again to protect her people. Nomingburg’s assassins would defend and avenge Halflings wherever they were. Tentineh called for Tracy’s help along with the other heroes of the land. Tracy answered the summons and fought alongside her companions to defeat the dragons in the Dragon War. After the war she went into the hibernating sleep that would allow the heroes to defeat the dragons once more if such a task was necessary. Tracy was the first to awaken when the Blue Dragon Orb binding the blue dragon Patriarch, Bavastatner, was broken. The breaking of the Orb released Bavastatner’s wife, Renveshalhiarisv. The two began to reestablish their empire over the Shacklack Desert. Tracy made moves to resist them, but was discovered by Bavastatner before she could set her plans in motion. Bavastatner breathed electric death upon her, all but ending the hopes of reforging the Blue Dragon Orb.